Conflicting reports on Thursday said a late-night truce, brokered by Egypt, had been agreed between Israeli authorities and militant group Hamas, following two days of violence in the Gaza strip. Reuters quoted Palestinian authorities on the agreed ceasefire; however, multiple reports cited anonymous Israeli officials as saying no such deal had been made. The escalation of violence has led to the deaths of several civilians, the Palestinian health ministry has said. In The Cube, the social media newsdesk at Euronews, we are working to verify the latest details in this complex story. The following video, captured Thursday, shows one of the last Israeli airstrikes on Gaza before the Palestinian-reported midnight ceasefire was due to come into effect. 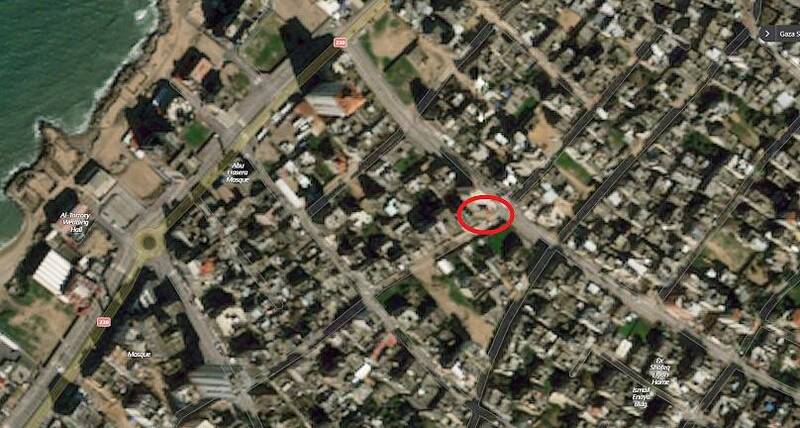 It shows the attack levelling a building in the Gaza strip. Drone footage from the same source shows the rubble from the building in the aftermath of the airstrike. The footage was uploaded to the YouTube account of Sadeel Media, a media group that regularly films and uploads high quality footage from around the Gaza strip. Around this time, the Israeli Defence Forces said it had conducted an airstrike on a building in the al-Rimal district of northern Gaza earlier in the day. 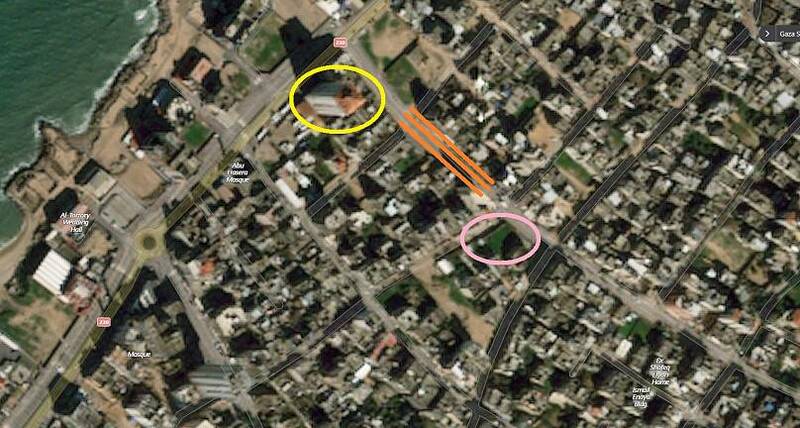 Making a note of placemarks in both the Sadeel Media videos, we compared these with satellite imagery of the al-Rimal district of Gaza to confirm the location of the strike. The first comparison was made between the turret of the building before it collapsed and satellite imagery of the al-Rimal district. Both have been circled in red in the screenshots below. The second comparison was again made between satellite imagery and a screenshot of the drone footage showing the aftermath of the airstrike. The colour-coded markers correspond in the two images, pinpointing the tall building with a distinct roof, the road running adjacent to it, and the green space opposite the building that was eventually levelled. In the aftermath of the strike, the Facebook page for the al-Mishal Cultural Centre in Gaza said its building had been destroyed. The same Facebook page had uploaded videos and photos in 2015 showing the same building that was seen being destroyed in Thursday's video of the airstrike. 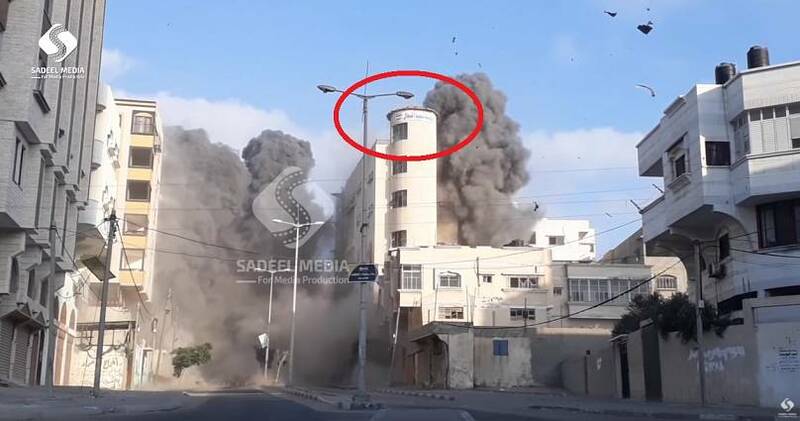 However, the Israeli Defese Forces said on Twitter that it believed the building had been used as an office for Hamas, the militant group governing Gaza. "The strike was carried out in response to the rockets Hamas fired at Israel, one of which was fired at the city of Be'er Sheva," the tweeted statement said. 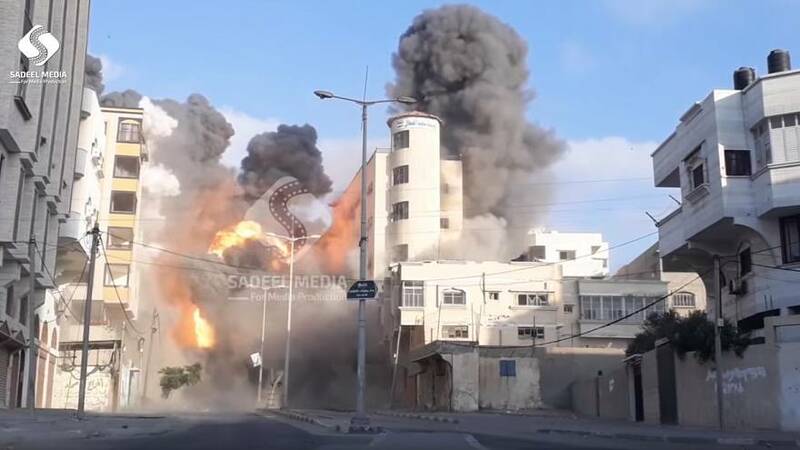 Footage showing several different angles of the same strike shows crowds of people in close proximity to the attack, suggesting that it was carried out in a populated civilian area of the Gaza strip. Gazans reacted in sadness on social media to the strike on the cultural centre. One Twitter user, Yousef al-Jamal, posted video he said he captured in 2016 showing a performance inside the cultural centre. Australia-baded Twitter user Ayman Qwaider said the building was where Gaza Cinema, a community initiative, once hosted movies. "I have many happy memories in this place," he wrote. Qwaider also tweeted a quote from his sister, who still lives in Gaza. "Bombs are pouring everywhere, shaking our house worse than an earthquake," she said. "I'm panicking paralysed unable to provide safety for my 2 yrs son whose night is torn by excessive sounds renewed rocket fire in Gaza." Media translator Maram Humaid said she laid with her two-year-old daughter amid the airstrikes. "Together we live or die," she wrote. The United Nations said it was "deeply alarmed" by the recent flare up of violence between Gaza and Israel, warning that the situation could "rapidly deteriorate with devastating consequences for all," should a ceasefire deal not be reached soon.